This week Motorola launched their first Google Android based handset CLIQ. The company calls the new handset “the first phone with social skills” to highlight its social networking live widgets that integrate Twitter, Facebook, Gmail, MySpace, Yahoo, Last.fm and more on the home screen. The new widget interface is called MOTOBLUR and it gives the user control over various interface features. AMD unveiled the new Radeon HD 5800 graphics card series that will start shipping later this year. 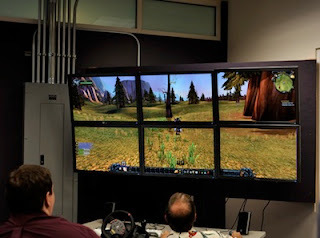 The new top of the line graphics card can power up to six DisplayPort outputs running at full resolution (2560 x 1600). The card is also capable of merging the six images into one single image as large as 8192 x 8192, if the displays allow it. AMD calls the new technology Eyefinity and it will allow pros and gamers to have panoramic views just like human eyes. AMD will announce Radeon HD 5870 and HD 5850 later this month. No other information about the new graphics cards was released. Everyone was surprised on Wednesday when Apple announced new iPod touch without integrated camera. However, teardown of the new iPod touch done by ifixit reveals that Apple left in room for a camera at top of the device circuit. This gives legs to the theory that Apple decided to remove camera in last stages of device development. 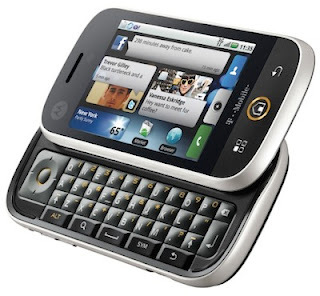 While the whole world was busy talking about new iPod lineup, Palm introduced their second webOS handset Pixi. 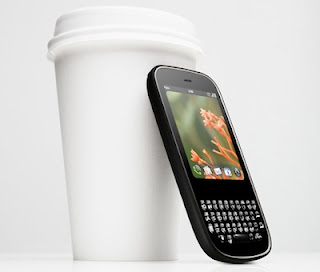 The Palm Pixi is a smaller and sleeker candybar shaped cousin of Pre with full QWERTY keyboard. The phone will come with 2.63-inch 320 x 400 touchscreen, 2-megapixel camera, EV-DO Rev.A, Bluetooth, GPS and 8GB of on-board storage. Apple today launched new iPod nano that comes with video camera, mic and speaker. The nano allows users to shoot video, view it on their nano and upload it to YouTube via their computer. Along with the new video camera iPod nano also gets a bigger 2.2-inch display, FM radio with live pause and iTunes Tagging and built-in pedometer. 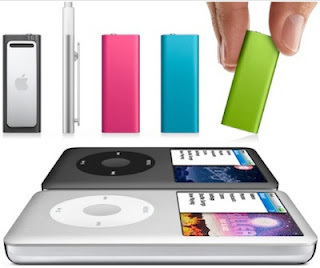 Apple today announced that 2GB iPod shuffle is now available for $59 in five colors silver, black, pink, blue and green. The 4GB model also gets the color makeover and it is available now for $79. “iPod shuffle is the world’s smallest music player and now comes in five great colors starting at just $59,” said Philip Schiller, Apple’s senior vice president of Worldwide Product Marketing. Apple today introduced iTunes 9 with features like iTunes LP, Home Sharing and Genius Mixes, as well as redesigned store and improved syncing. Apple today announced the new iPod touch without the much-rumored built-in camera. The 8GB iPod touch is now available for just $199, along with new models, which deliver twice the capacity for the same price, with the iPod touch 32GB model for $299 and 64GB model for $399. That's all from the live event, we will posted detailed coverage of all the announcements made by Apple later today. Steve is back in stage and he thanks Norah Jones. Steve thanks everyone for coming. So no surprise announcement from Apple. Basically it was just music event with new iTunes 9, iPhone OS 3.1 with Genius Mixes support and new iPods. And the "one more thing" was the most boring ever done by Apple. It looks like that's it from Apple event as Steve has invited Norah Jones to play some live music on stage. Apple is showing iPod nano ad. Steve is now showing Environmental checklist for iPod lineup that shows that iPods are Arsenic free, BFR free, Mercury free, PVC free and highly recyclable. The nano now has 2.2-inch display, polished anodized aluminum casing, microphone and speaker, voiceover, and built-in pedometer. The 8GB model will be $149 and the 16Gb model will be $179. 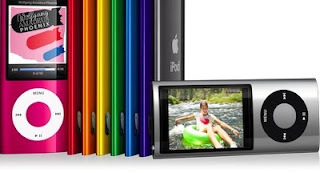 iPod nano is available today in nine colors. Steve says nano is the most popular player in the world and Apple has sold over 100 million nano. Along with video camera Apple is also adding FM radio and Genius Mixes feature to Nano. He says we have build a camera into the back of every nano. He compares the size of nano to pocket camcorders available on the market. Steve is back on stage he says "one more thing". And it's "Video Camera"
Next is iPod classic, it gets 160GB hard drive for the same price of $249. Apple is introducing 5 new colors for iPod shuffle. It will be available in 2GB model for $59 and 4GB model for $79. Apple will also ship a Special Edition 4GB shuffle made of polished steel for $99. Now he is showing a new iPod touch ad. The ad is dedicated to gaming experience on iPod touch. Phil adds "we have learned that $199 is a magic price point so that's what we're going to do with iPod touch." 8GB touch will now be priced $199, 32Gb will be $299 and 64GB will be $399. No 16GB model in the lineup. Phil says iPod touch is more affordable gateway to App Store at $229 and no monthly fees. Phil is back on stage. It looks like Steve has give full control of the keynote to Phil. EA is showing Madden NFL 2010, it will come to App Store very soon. Gameloft is showing a FPS called Nova that looks like Halo. The graphics are really good and you can listen to your own music while playing the game and multiplayer is available over Bluetooth and WiFi. Gameloft is up now. They say that more than 20 million Gameloft titles have been downloaded from App Store and they have 35 titles available. The game he is showing is Riddim Ribbon, which is like a combo of Wipeout and Rock Band. Next up Tapulous, Ben Decrem from Tapulous says "when we launched a year ago, our crazy goal was to get 1 million users.. we got that in 3 weeks." They are showing Prince of Persia. Ben from Ubisoft says "Apple has created a world class gaming experience on this platform." Now game developers are coming on stage to show their new games. First it's Ubisoft. Playing a demo video for different games on the iPod touch. Phil says iPod touch has over 21,178 game and entertainment apps compare to 3,680 for DS and 607 for PSP. He now compare it to Sony PSP, Nintendo DS and Dell netbook, saying that it bring more functionality than the first two devices and it fits in the pocket. Now phil is talking how great iPod touch is. He says that customers have figured out that touch is not just a music device but it's a great pocket computer also. So Apple has sold over 50 million iPhone OS based devices in about 2 years. Phil says Microsoft has 1.1 percent market share. 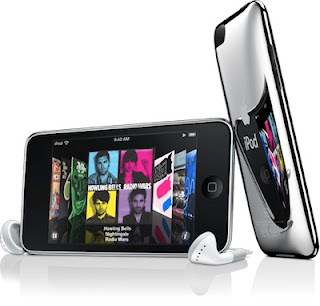 iPod touch is the fastest growing device in iPod lineup and Apple has sold over 20 million units. iPod has 73.8 percent market share and Apple has sold over 220 million iPods. iTunes demo is over Phil and Steve are back on stage and Phil talks about iPod. It is iTunes Extras feature now showing cast interviews, exclusive clips, behind-the-scenes footage and photo galleries like on DVD or Blu-ray disc. Now Jeff is showing iTunes LP features that allows you to view animated lyrics and liner notes, performance videos, artist and band photos and more. The iTunes 9 interface is very clean and way easier to navigate. Facebook and Twitter integration is also very intuitive. He is now showing the new and improved Sync that allows you to do selective transfer of Music, Movies, TV Shows, Audiobook and Applications. You can decided what you want to transfer Automatically and what you want to transfer manually. Jeff Robbin is now demoing iTunes 9. he starts by showing the new App organization feature. 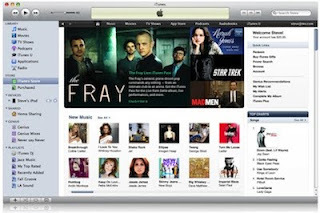 Apple has also redesigned the store to make it easier to find new artist, songs and movies. And like we wrote before Apple has added iTunes LP feature. You can now copy songs, TV shows and movies to up to 5 computers in your house. You will see all the computers in iTunes so that you can simply drag and drop content. iTunes 9 will have Genius Dj that will play songs from your library that go great together. Apple is also adding ringtones for iPhone that will be priced $1.29 compared to $1.99 charged by most carriers. App Store has over 75,000 applications and Apple is introducing iPhone OS 3.1 that adds Genius feature for App Store. That will recommend applications based on previous purchases. He asks Phil Schiller to join him for the presentation. He announces in 2 years Apple has sold over 30 million iPhones. He says "I'm very happy to be here with you all. As some of you might know, I has a liver transplant." he thanks everyone at Apple for their support. So Steve is back and is on stage now.. gets a standing ovation. The whole atmosphere is of Rock and Roll. Apple is playing a rock song today. We are in the hall and the keynote will start in few minutes. iTunes Extras will bring cast interviews, exclusive clips, behind-the-scenes footage and photo galleries like on DVD or Blu-ray disc. According to Apple, iTunes LP is a visual experience of the record album. A gorgeous, immersive digital version of select albums that allows you to dive into beautiful animated lyrics and liner notes, performance videos, artist and band photos and more. The new feature in iTunes 9 are faster navigation, easy preview and buy, iTunes LP, and iTunes Extras. But like we said in Apple Event Rumor Roundup iTunes 9 will be available as soon as the event finishes. However, when you click on the download link it takes you to iTunes 8.2.1 download page. Will Steve Jobs do the keynote, what do you think? We have added Apple Event Rumor Roundup that you can read till the Apple Event starts. Apple invited analysts and media to a press event on September 9th that will be held at Yerba Buena Center for Arts in San Francisco. It is rumored that Apple will launch the next generation iPod lineup with integrated camera and iTunes 9 at the event. 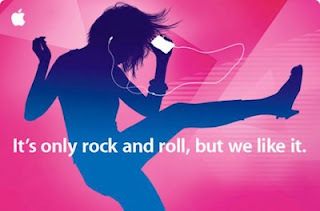 There are also rumors that the event won’t be just iPod only and we might see a new device (may a tablet) at the event. We will be doing live coverage of the event at live.TechzTalk.com on Wednesday September 9 starting at 10 AM PST / 1 PM EST / 6 PM London. Please join us then to find out what Apple has up its sleeve. 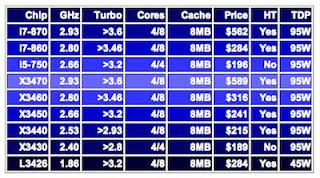 Intel today introduced new Core i7 and Core i5 chips. The new processors are more affordable versions of Core i7 900 series and comes with dual channel memory interface in place of triple channel setup found on 900 series. The new processors also feature Turbo mode that enables the processor to scale up to 3.6GHz for i7-870, 3.46GHz for Core i7-860 and 3.2GHz for i5-750 by switching off one or more core. 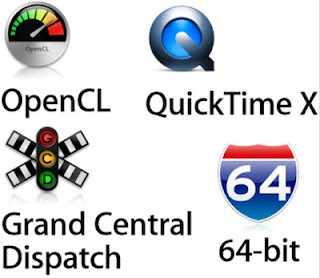 Grand Central Dispatch (GCD): It is a set of technologies that makes it easier for developers to create programs for multicore processors. With increase in number of all the cores in a processor it is becoming increasingly difficult to efficiently use power of these cores in a processor. GDC makes Mac OS X multicore aware and optimizes it for allocating tasks across multiple cores and processors. Once developers start using GCD for their applications you will notice significant increase in performance on your multicore system. OpenCL: OpenCL stands for Open Computing Language – a C based programming language that allows developers to use graphics processors for general computing purposes. Graphics processors are becoming more and more powerful, and by using OpenCL developers can make their applications perform complex operations using graphics processors. Apple says that by using OpenCL developers can make desktop accounting applications with sophisticated financial modeling techniques that required servers before or have more realistic physics simulations in games or design media applications that can handle larger video and graphics files. 64-bit: Previous version of Mac OS X (Leopard) was 64-bit capable in many ways, but Snow Leopard takes the next big step by rewriting nearly all system applications and kernel in 64-bit code. A 32-bit application can only address 4GB of RAM, whereas 64-bit application can theoretically address up to 16 billion gigabytes of memory. Also 64-bit can enable computers to processor twice the data per clock cycle, which will boost overall performance. The best part about Mac OS X Snow Leopard is that it can run both 64-bit and 32-bit applications simultaneously, so you don’t have to worry about whether the applications you use are 64-bit or not. QuickTime X: Apple did introduce the new QuickTime Player in Snow Leopard, but we aren’t talking about the player. QuickTime X is the media technology that powers audio and video experience in Mac OS X. All the applications like iTunes, Safari or iPhoto use QuickTime to playback audio and video. The new QuickTime X offers optimized support for modern codecs like H.264 and AAC for smooth and stutter free playback of high definition content. It also support HTTP live streaming for Internet video streaming using HTTP protocol, which makes video streaming work reliably with common firewall and wireless router settings. Apple says QuickTime X is 2.4x faster than QuickTime 7 and it uses GPU acceleration for fluid video playback experience. Automatic Printer Driver Update: Most of us don’t bother with updating printer drivers unless our printer stops working. However, updating drivers can add new functionalities, improve performance and rectify defects. Mac OS X Snow Leopard periodically checks for latest drivers and automatically downloads the newest version through software update. When you connect a new printer to your computer, Snow Leopard can download the most up-to-date driver over the Internet using the new feature. 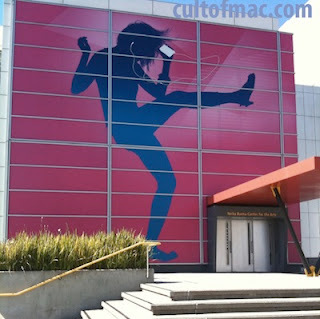 Cult of Mac has posted images of Yerba Burna Center for the Arts showing that Apple has already started preparing the center for upcoming Apple iPod Event on September 9th. Last week, Apple had sent out invitations to various analysts and media for the upcoming event that will be held at Yerba Burna Center in San Francisco at 10 AM PST / 1 PM EST on coming Wednesday.